The CHATILLON HB-1000 Series portable platform scale features a rugged cast-iron construction with corrosion-resistant bearings, making it ideal for industrial plants, warehouses and terminals. The HB-1000 meets the requirements for Handbook 44 Class lll and is suitable for "Legal for Trade" applications. The CHATILLON® HB-1000 Series portable platform scale features a rugged cast-iron construction with corrosion-resistant bearings making it ideal for industrial plants, warehouses and terminals. The HB-1000 meets the requirements for Handbook 44 Class lll and is suitable for "Legal for Trade" applications. The HB-1000 features a large 18 x 17-inch (457 x 685 mm) platform. The graduated beam may be read from both sides. Graduations are black on a matte background. Weight is read from the center of poise. 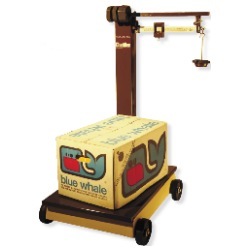 Wheels enable you to move the scale to different locations. HB-1000 Series scales conform to NIST Handbook 44 Class III, C.O.C. No. 88-151A2. Scales are “Legal for Trade” subject to on-site verification by local Weights and Measures jurisdiction.